Know more about us and be a part of our dialogue. The Tyson Center for Faith and Spirituality in the Workplace will create learning experiences for students that will enhance their self-knowledge by clarifying their faith (core beliefs) and values; and we will prepare them to be effective, authentic leaders in increasingly global workplaces. We will be a nexus for thought leaders to exchange views and encourage research projects around faith and spirituality in the workplace. 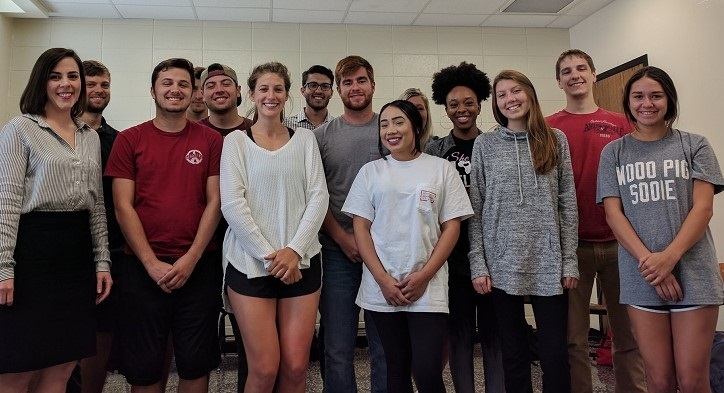 The Tyson Center introduced the course "Faith, Spirituality and Workplace" (MGMT 4103) in Fall of 2017 with two sections and 30 student capacity. The class has now grown to a capacity of 50 students and continues to grow with increasing demand. With workplaces all over going more and more global, the class taught by Dr. Denise Breaux Soignet (far left in picture from 2017), focuses on educating students to be aware and be sensitive to religions in workplace and consider the complexity in issues related to one's faith, values and purpose and how they may influence the workplace. This free course, which is open to all students, has shown to have significant benefits on sleep, perceived stress, mindfulness and self-compassion. The University of Arkansas Libraries Special Collections has announced the opening of the Martin Rutte Spirituality in the Workplace materials to researchers. Browse findings from the Spiritual Based Leadership Program, an inquiry into the nature, activities and results of leading from a spiritual basis.